This is one of my very special books! It started as a Japanese ledger book (or this is what I had in mind for the paper), but looks like it had its own plans and turned into a hardcover sketchbook, a "tibetan journal". So I let it have its own way! It is a combination of different cultures which blend into a unique item, an ode to the duality of human nature! The covers are dressed with Khadi paper. This is a 100% cotton paper made by hand in the village of Tarihal near Hubli, in Karnataka, South India. Khadi rag papers are made from 100% cotton rag, which have longer fibers than linters that are generally used in papermaking. These genuine rag papers are known for their exceptional strength and durability. The focal point is a jade amulet carved by a Tibetan artist, with a charm of duality - the yin and the yang that make a whole. This duality lies at the origins of many branches of classical Chinese science and philosophy, as well as being a primary guideline of traditional Chinese medicine,of different forms of Chinese martial arts and exercise, as well as appearing in the pages of the I Ching. It is placed upon a filigree metal casting, produced by a US artisan. Near the spine of the book there are two raw wood pieces from Oregon US and at the opposite side the closure features carved wooden beads made from Thailand. The concept of duality continues inside the book, in the form of two different parts - a black and a white. Both booklets have their own soft covers from black Japanese washi paper with golden designs that complement each other. 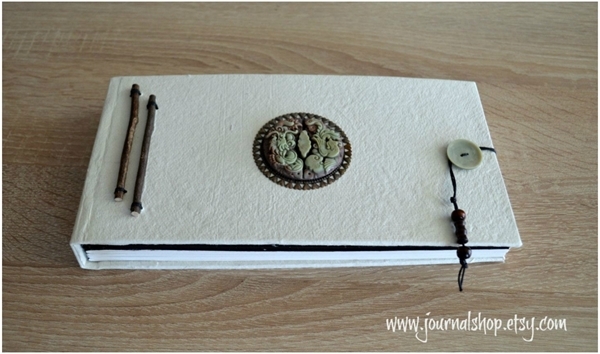 The book has 84 pages (counting both sides) and is sewn with irish waxed linen thread. Both booklets feature 300gsm paper. The black is smooth cardstock and will be the joy of any artist who uses white charcoal or pencil, metallic pencils and any medium which benefits from a dark substrate, while the white is Fabriano watercolor and has a tooth to support all wet and dry media. It has neutral PH and it is acid free and chlorine free. It's size is 25 x 13 cm in a landscape format. It is acid free and suitable for photos. It can be used as a guest book, an artist journal, a black and white sketchbook, a photo album, a diary or as a special family keepsake to record the history of your family along with photos. It is a great conversation item and is a unique gift for a new couple. It comes with its own cotton bag, to be stored safely and/or be nicely presented as a gift.